Confession: This dish doesn't really have a name. I made that one up as I was typing it. If you come up with a better one, please feel free to use it and let me know so I can use it too. So it's a no name/no recipe dish, but it is so good. If you haven't used green chilis before, don't be scared. They're not spicy hot, just full of flavor. I promise. And the green chili/garlic combo here is what works so well. Now you're going to build it like a lasagna. Spread a bit of the sauce into the bottom of a 9x13 pan. Tear tortillas in half and place them down until they nearly cover the bottom of the pan. Then a layer of the chicken mix, lots of cheese, another layer of tortillas, and keep repeating. You decide how many layers you want. I say the more, the better. When you're done, top it with the last bit of sour cream chicken mix and a sprinkling of cheese. Pop it in a 450 degree oven until it's golden and bubbly around the edges. This is super cheap, delicious, and easy as it comes. I always end up eating too much. Super YUM! Can't wait to try this on THE TRIBE! Mmm, looks good! I may make this tonight. I have a similar recipe but instead of flour tortillas, it calls for tortilla chips. That is good too! Looks wonderful! I have a similar recipe and have never added garlic, but my hubs and I are huge garlic lovers so I will have to try this. Do you use flour or corn tortillas? I do flour tortillas, but I'm sure corn would be good too - similar to Debby's recipe with tortilla chips. This sounds fantastic! So much better than the turkey sandwhich I'm eating for lunch! sounds like my sour cream chicken enchiladas :) yum! This sounds delicious!!! I will definately have to try this!!! Sounds delicious! What a great twist on enchiladas! That's why I like you so much! So you cook like I cook. Just throw things together and hope it turns out. Rarely do I follow a recipe. My chicken enchiladas are similar to this. We love green chilis here. And garlic. Yum! I absolutely love green chilis. This is similar to my chicken enchilada recipe as well. I use corn tortillas and usually mix in a can of cream of chicken soup with the filling. Yumm!! Thanks for sharing this! Looks delish! Anything with green chilies and cheese has GOT to be good! I am really hungry now...thanks a lot!!! I made it for supper. YUM!! Very good! I decided to call it "Mexican Lasagna". Thanks for the recipe, Beki! Yum! It looks a bit like these chicken enchiladas I make with cream of chicken soup. 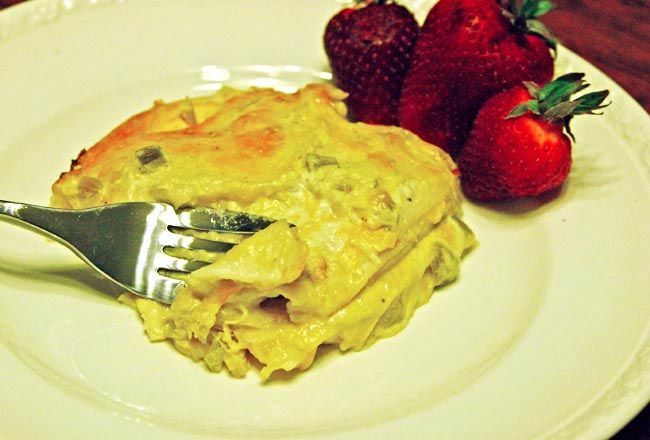 mix the chicken with the sour cream and green chilis ( I add an can of healthy request cream of chicken soup) stir then add the cheese and cut up tortias... no layering! top with some extra cheese and back.